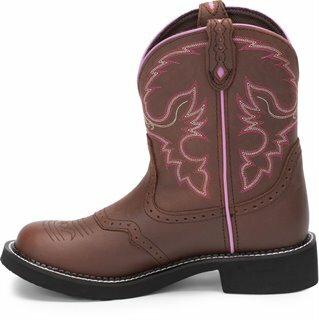 The 8-inch tall Gemma Aged Bark Justin Gypsy™ Women's cowboy boot features a chocolate brown leather exterior with a slightly vintage feel. 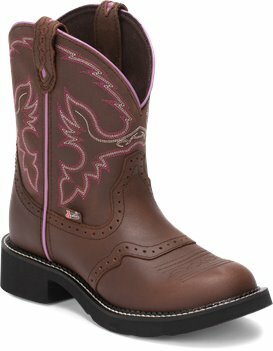 The rustic brown provides a neutral backdrop to the hot pink and cream stitch pattern on the upper. The pastel pink seam on the quarter and trim provides an element of femininity and the diamond cut pull strap is a signature detail. Its round toe and unit heel provide an easy fit and the J-Flex Flexible Comfort System® insole with removable orthotic inserts add cushion and support in or out of the saddle.